Burgundy, France, St Joseph Abbey. 30 June 2002. Six days later, on 6 July, centenary of the martyrdom of St Maria Goretti, I would receive the laying on of hands and the gift of the Holy Spirit that would make me a priest forever. I was expecting 25 members of my family from the USA, mostly from my hometown of Louisville, Kentucky. We had been preparing this for months, and the next day, the invasion would begin. In addition to the spiritual preparation for ordination, this was my big concern. I had enough to think about. Lo and behold, on that Sunday, a young couple with their four-year-old boy from — of all places —Australia rang the abbey doorbell, and were welcomed by our porter. In spite of his efforts to communicate in English, he needed my help, and so I was invited to meet Stuart and Martine Watkinson, with their charming little boy Peter. I confess that my first thoughts were not overly enthused. What can I say? I had a lot on my plate. Couldn’t they have come at another moment? Why did they have to come now, when I had my hands fuller than ever! Little did I know that this meeting would change the direction of my life. The Watkinsons stayed all that week, and were present at my ordination and first Mass. By the time they left, we had become good friends, but, I must say, I was not sure we would see them again. 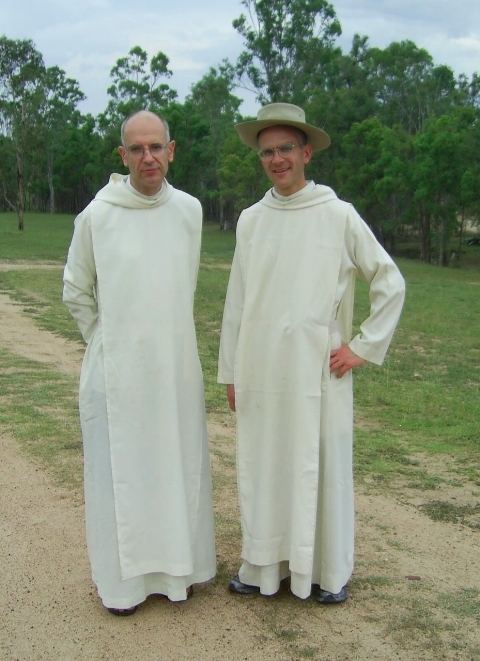 These “Aussies” had come with a very unusual request: they were touring French monasteries, trying to find some unsuspecting abbot who would accept to send monks to found a monastery in Australia! Of course, the unsuspecting abbot they did not find. What they did find was a large number of very suspicious ones for whom founding a monastery in the Antipodes would be like founding one on the Moon! They left with a flat “no”. So why would they return? That’s God’s secret. But where did this young couple come up with the rather exotic idea of traveling to Europe to get some monks to come to Australia? They were troubled by the direction of our culture and civilisation, and their vision was to revitalise their homeland through an “injection” of traditional, contemplative Benedictine monastic spirituality. Where did they get that from? Mainly from an article titled “Western Monasticism – How the West Will Be Won Again,” which was published in an Australian Catholic periodical, Oriens. After reading the article, Stuart and Martine came to understand the pivotal role of Benedictine monasticism in civilising the western world, and that this is what was needed to heal the critical illness of the West today. They then felt a strong call to do everything they could to bring a traditional Benedictine monastic foundation to Australia, to spearhead the rebuilding of Christian culture and civilisation in the Land Down Under. After their initial stay in Flavigny, the Watkinsons returned several times over. They also returned to other abbeys, but in Flavigny they had a battering ram, namely our retreats. Unlike the other Benedictine communities of France, Flavigny was founded for the specific purpose of offering retreats. Stuart and Martine realised this very quickly, and so they came back and asked the abbot that if he couldn’t found a monastery, at least he could perhaps send monks to hold retreats. With my ordination, Flavigny had just begun to organise English-language retreats in France and the UK and would soon do so in Ireland. I agreed that it would be a good way to begin, but before that could happen, our abbot needed to give permission to myself and a brother monk to travel to Australia to lead the retreats. Similarly, an Australian bishop would be required to invite us to his diocese for this purpose. The Abbot of Flavigny, Dom Antoine Beauchef, has a very big heart, expanded by several decades of monastic life; authentic needs always find an echo there. He came to perceive that the need was real, but still, it seemed impossible: Australia! A 20-hour flight, and the jet lag, and the distance from the abbey, and everything else… But Stuart and Martine were not daunted; they continued to return and to ask. In mid-2006, Father Abbot finally gave his approval for two monks – Fr. John Dupré and myself – to travel to Australia in November/December 2007 to lead the inaugural Ignatian Spiritual Exercises in the diocese of Parramatta at the former Assumption Seminary in Plumpton, New South Wales (which has since been demolished). This retreat, which was given with the blessing of Bishop Kevin Manning whom we met at the time, would be the first of our visits to Australia – taken roughly every two years – with each visit lasting around three weeks and including two retreats for men, and one or two recollections for women. After a few years, our retreats in New South Wales (which from 2011 would be held in the diocese of Wollongong with the blessing of Bishop Peter Ingham) were supplemented by retreats in Queensland, with the blessing of Archbishop Mark Coleridge. It is noteworthy that we have never had trouble filling up the retreat centres in Australia; whereas our problem elsewhere is usually finding “recruits”, here the problem was knowing where to put them. With each visit to Australia, thenumbers of retreatants steadily increased, to the point where we added additional retreats. Vocations began to present themselves, looking for somewhere to go and live a life that the retreats inspired them to seek. We also met more Australians – laity and clergy – who had discovered Benedictine spirituality through visits to monasteries (like Flavigny, Le Barroux, Fontgombault, or Clear Creek) overseas, sometimes becoming Benedictine Oblates themselves. It was not clear from the start where all this would lead, but what I can say is that, from the second visit of the Watkinson family in 2003, I was already convinced that God wanted us to do something in Australia. That something was not just the odd retreat every now and then, but something that would take root and last. Several more years would be required to get there, but it happened. 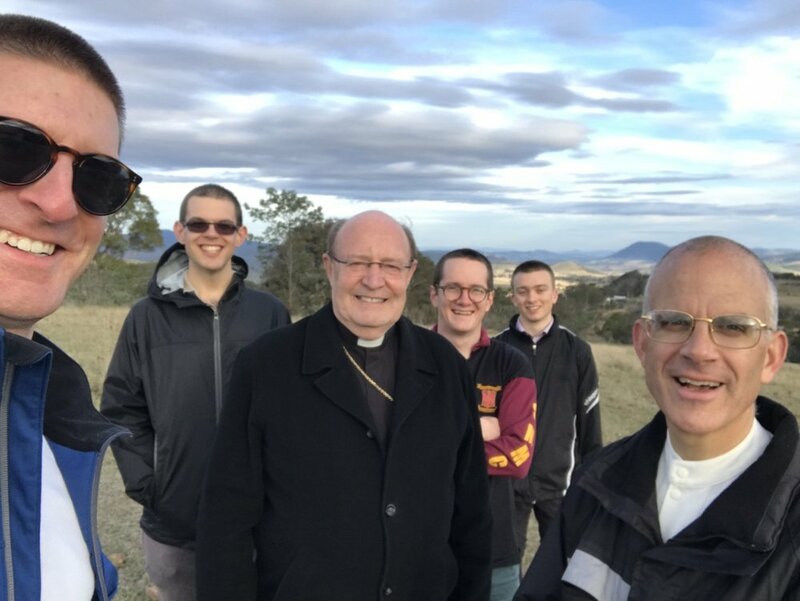 Some young men came forward wanting to try monastic life, and in 2016 Abbot Antoine finally consented to my coming to Australia for good in order to give them the formation they need under the authority of a local bishop. The project would not have been possible without the support and invitation of an Australian Bishop. In 2015 and 2016, I encountered a good number of these and met with lots of openness and willingness to support the project. The negotiations led us to Tasmania where Archbishop Julian Porteous has welcomed us with much paternal warmth, and great openness to the ways of the Holy Spirit, who “breathes where He wills”. On 22 February 2017 — the feast of the Chair of St. Peter — Notre Dame Priory was initiated with a solemn High Mass in the presence of Archbishop Porteous at St. Patrick's Church in Colebrook, Tasmania. As of this writing in July 2017, the small community — which is not under the Abbey of Flavigny but under the jurisdiction of the Archbishop of Hobart — currently has four postulants, living provisionally in a former presbytery owned by the Archdiocese of Hobart and located in the suburb of Lindisfarne. We have just acquired however 64 acres of land in Rhyndaston, Tasmania, on which to establish a permanent home and build amonastery. At this stage of the project, the young candidates are receiving their initial formation to monastic life, which includes study and practice of the sacred liturgy, study of Latin, the psalms, the catechism. Various household chores needed for the upkeep of a community of men help them keep a balance between study and work. We hope that in a few months time, we will be able to welcome these men as novices and clothe them with the Benedictine habit. Dedicated to God following the Rule of St Benedict, the monks will take vows of stability, conversion of life, poverty, chastity and obedience, and spend their time in prayer and labour for the glory of God and the salvation of souls. Our most important prayer is the solemn celebration of the Sacred Liturgy with the Holy Mass and Divine Office eight times a day, source and summit of the life of the Church. Our first and most important work — enshrining the apostolic and missionary dimension of our life in the tradition of such great Benedictine figures as St Augustine of Canterbury, St Boniface, Archbishop Bede Polding, Bishop Rosendo Salvado — is to provide silent and guided retreats, both in the future monastery precincts and in other venues where silence can be maintained, based on the Spiritual Exercises of St. Ignatius, an invaluable aid for the conversion of souls and their ongoing progress in reaching sanctity. My vision for this foundation is that it will attract numerous young men to lead the Benedictine life, and that in the near future the monastery will provide not only a home to those who are called to be part of the community, but will also have a large guest house and retreat centre where both men and women can come to spend time with the monks, taking part in their liturgy and enjoying the peace, quiet and laborious joy of the cloister. It is also hoped that there will one day be a nearby twin monastery of Benedictine nuns who would also support the monks’ retreat apostolate by overseeing a retreat house for women. The primacy of liturgical prayer and the retreat apostolate being safeguarded, there will be ample room in the monastery for all that Benedictines have been known to do throughout history, from agriculture to teaching theology, from publishing and book-binding to giving spiritual guidance. Any work that is compatible with the essentials of their life can be undertaken by the monks for the glory of God and the salvation of souls. As my first and most demanding duty is the provision of solid formation in the monastic life to the men who enter the community, Notre Dame Priory is, especially in these early years, in need of many generous benefactors. In addition to paying off the loan which allowed us to purchase the land, the community will need to build a monastery and retreat centre and have also at its disposal all that is needed for the retreat apostolate. It is obviously a gigantic endeavour, one that will become reality only thanks to the generosity of many friends. Every donation helps. A few years down the road, Notre Dame Priory will, please God, offer the sacrifice of praise in beautiful monastic buildings, and will be able to welcome men and women guests to take part in the riches of its life dedicated to God and the service of souls. Please consider a donation to support the prayer and work – ora et labora – of the new Benedictine community in Australia, whose life is dedicated to the Immaculate Mother of God invoked as Our Lady of Cana. With your help, it will become a reality!